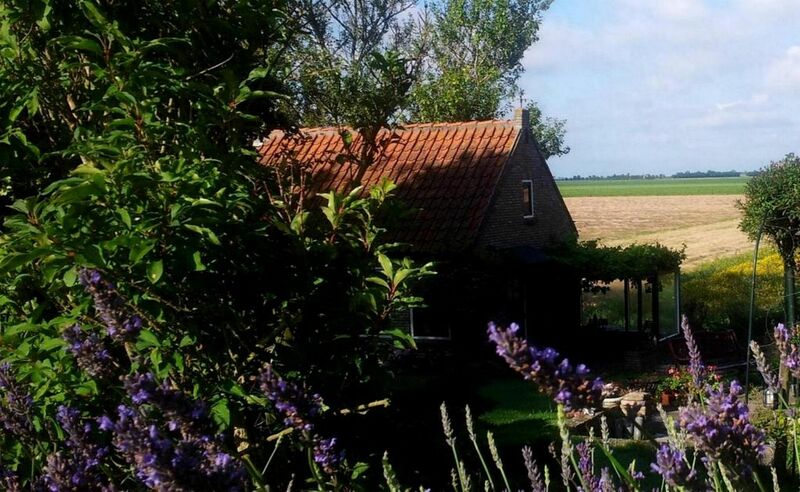 The Cottage is a detached holiday house situated at the foot of an embankment in the agricultural outskirts of Schouwen-Duiveland. The cottage is equiped for 2 adults. Space, peace and nature are characteristic of this residence with it’s lovely views over the ackerland, a 10 minutes walk from the Grevelingen lake and only 15 minutes car drive from the beach and sea. Ideal for nature lovers, water sports enthusiasts and for those seeking privacy and tranquility. The cozy living / dining room has a kilometers wide view over farmland. The mini kitchen includes a refrigerator and 2 electric burners. The pantry is suitable to prepare your breakfast, lunch and light meals, coffee maker, kettle and toaster are available. From the back terrace with sun chairs and parasol you can enjoy the sun and panoramic view. The upper floor is furnished as a bedroom and bathroom with shower, toilet, sink and hair dryer. 2 boxspring beds ensure a perfect night's sleep. There is room to store your luggage and clothes. You rent the cottage with terraces, the garden surrounding the house of the owner is private. The Cottage has its own entrance on the embankment across a garden path. There is enough space to park your car / sailboat on the dike. The Cottage is uniquely situated in the area between Zonnemaire and Brouwershaven, on the beautiful island of Zeeland with the most sunshine nationwide. Ideal for boaters, divers, hikers, nature lovers and cyclists. 5 minutes away is a small harbor where you can launch a boat and where you find a beach with sunbathing field. In nearby picturesque Brouwershaven are several restaurants and cafes and a small supermarket with post office and ATM. Zierikzee is the largest town on the island, 12 km from The Cottage. the villages Burgh-Haamstede and Renesse focus on tourism and have numerous entertainment opportunities. At Westenschouwen you will find one of the finest dune areas in The Netherlands with hiking-, biking trails, mountain bike- and horse trails through the dunes and forests. At various places you can rent bicycles or a sailboat. There are boat trips on Lake Grevelingen and the Oosterschelde. Visit the unique storm surge barrier on the island Neeltje Jans with exhibits and seafood restaurant. There are beautiful beaches all along the North Sea coast with several very pleasant beach pavilions (Perry’s at the Brouwersdam is a personal favorite). There is a bus service in Zonnemaire to Zierikzee and other places on the island. You can rent bikes from the owner. The owner lives in the house near The Cottage. He's happy to inform you about the area and provide tips to assure you have a pleasant stay. The Cottage stands out in comparison to many holiday homes thanks to its atmospheric and high quality furnishings. Box spring beds with extra topdek mattresses ensure a good night's sleep. A perfect location for relaxing and drawing your own plan. This holiday home is ideal for cyclists, hikers and water enthusiasts and for those who seek peace, privacy and a great wide view. This holiday home is ideal for cyclists, hikers and water enthusiasts and for those who seek peace, privacy and a great wide view.The Cottage is located at the foot of a dike; The quiet, polder road is located on the other side of the dike, making it not perceptible and barely audible. Delightfully relaxing in the polder landscape and enjoy water and nature and all the benefits that it offers in the notourist area of the island while, if desired, you can find plenty of entertainment within 10 car minutes. Spacious shower cabin and 80 liter boiler providing hot water for a long time. Outlet for a shaver or elect. tooth brush next to the sink. Das Cottage ist ein wunderbarer Ort, wenn man viel Ruhe und Erholung sucht. Das liebevoll eingerichtete Cottage ist sehr idyllisch, sehr sauber und sehr gut ausgestattet. Es fehlte an nichts. Etwas abenteuerlich ist die Leiter zur oberen Etage (für fitte Menschen kein Problem), aber genau solche Details machen das Cottage aus! Man ist mitten in der Natur, die Schafe stehen direkt vor der Terrasse - von dort kann man, wenn das Wetter mitspielt, einen herrlichen Sonnenuntergang beobachten. Zum Brouwersdam und den Orten (Renesse, Brouwershaven, etc) ist es mit dem Auto nicht sehr weit, aber auch mit den Fahrrädern lässt sich die Umgebung wunderbar erkunden. Rob ist ein sehr netter Vermieter, der einem viel Freiraum gibt, aber einem auch sehr gute Tipps gibt, wenn man danach fragt. Wir empfehlen das Cottage sehr gerne weiter! Vielen Dank für dieses nette review Luisa! Toll, dass Sie genossen haben. Ein wunderschönes Cottage. Ein wunderbarer Ort zum Entspannen und Kraft tanken. Die Terrasse ist ein Traum und man kann wunderbar den Sonnenuntergang genießen. Ich werde definitiv wieder kommen.